Your Delivery Doesn't Show Up. What Are Your Rights? More often than not these days, you're saving money by ordering online for delivery. The retailer does not have to pay overheads on a storefront or customer-facing staff, and this saving is enough to off-set the added delivery charge. However, there are drawbacks with delivery. Your goods or service might be delayed, or not show up at all. Most people think this is just something you have to put up with, but we're here to tell you different. Deal with the retailer you bought the item from. Even if it was a separate courier company making the delivery, even if it was the courier who was at fault, your contract or business agreement is with the retailer, and the courier is an agent on their behalf. The exception to this is if you ordered an item to be collected, and then separately booked a courier service to collect and deliver it. In this case you should look into your consumer rights for a refund from the delivery service. The retailer is liable for your direct loss (i.e. 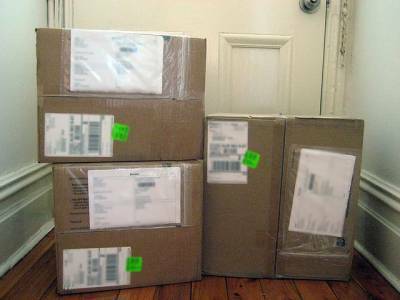 the amount you have paid for the item you did not receive) and any consequential loss due to their failure to deliver. If you take a day off work to receive a package, and when it doesn't show up you have to take another day off, the retailer is only liable for the second day you took off, as you would have taken the first day off anyway if they had delivered on time. This liability could include loss of a day's wages or loss of a holiday day. In order for your complaint to be valid, it must be seen as ‘reasonable' in a court of law, so don't try to push your luck. If there is a way you can receive your delivery without costing yourself or the retailer any more money, you're obligated to try this first, even if it is inconvenient. Remember that because of Distance Selling Regulations, you can cancel your order for a full refund (including postage, but not necessarily return postage) up to seven working days after you place the order. When you order goods for delivery online, by phone or by mail order, you are given a delivery date, but usually the retailer's terms and conditions will state that they are not responsible for delayed deliveries. If they miss their delivery date, their only legal obligation is to get the goods to you within a reasonable period, which is open to interpretation in a court of law. If you need the item before a specific date, you are taking time off work to receive it, or if it has to be delivered by a certain time before you leave etc. then it is worth mentioning in your order that time is of the essence. If this is recorded as part of your purchase agreement, then delivery time becomes a condition of the sale, and if the delivery is late your agreement is invalidated and you are entitled to a refund. Make sure the phone operator acknowledges that time is of the essence, or include it in the ‘Additional Information' or ‘Delivery Comments' section of an online order. You can even use this phrase when ordering for delivery in-store, but make sure it is recorded as part of the transaction. While it's rare for a company to pay a monetary value for emotional damages or distress caused for a delayed or failed delivery, added inconvenience can strengthen your case. For example, if you didn't receive your costume in time for a party, or your new sunglasses before a holiday, then it can be shown that your requirement of the product was conditional based on the delivery time. You can ask for additional compensation if the product is less useable due to the delayed delivery, especially if you informed them ahead of time that time is of the essence. Now that you have an idea of your rights, it's a matter of contacting the retailer and asking for compensation. Which will be discussed in detail in a future blog post.